Finished in Azzurro Mettallizzato with a black interior, this 400 GT 2+2 was personally picked up at the factory by the original owner and his son. The two returned to the factory with the car for a service in 1969 and the son then stayed on to serve as an apprentice. He learned everything he needed to, to keep his father's Lamborghini on the road. In 1971, the owner moved to the South of France and brought the car with him. At that time, it had accumulated around 50,000 km but subsequently was used only sparingly. It was started and driven just enough to ensure it was preserved in full running order. After 50 years of ownership and still in highly original condition, it was finally consigned to auction early in 2018. The second owner also set out to preserve the car and it remains in the same highly original condition as when it came of storage in May of 2016. 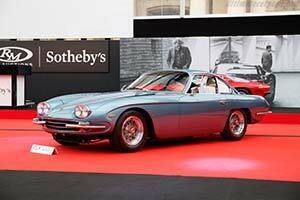 In 2019, it was consigned to auction once more and will cross the block in the RM Sotheby's Villa Erba sale.